HYDROLYSED COLLAGEN: 5000mg of hydrolysed collagen in each serving, with small peptides of low molecular weight to allow for optimal absorption in contrast to traditional collagen. Starting in our early twenties, collagen production declines by around 1% each year. Women in menopause are especially susceptible to collagen decline, and can lose as much as 30% of their skin collagen in the five years following menopause. The effects of slowed collagen production are visibly obvious when skin loses its structure, sags and wrinkles which is why it is important to supplement it from within. WILD PHYTOPLANKTON: Marine wild phytoplankton contains over 65 nutritional properties including all the amino acids, all the essential fats, all vitamins, key minerals and trace elements, rare anti-oxidants, phospholids, electrolytes, nucleic acids, enzymes and co-enzymes we need. It is designed to work with the intelligence of the body. It is believed that it is the combination and proportion of elements and nutrients that make marine phytoplankton unique and so effective in enabling cellular regeneration and therefore anti-ageing healing. Our marine wild phytoplankton may be one of the best weapons to use in battling premature aging. L-GLUTATHIONE: L-Glutathione is believed to be one of the most important and effective antioxidants. As we grow older, our l-glutathione levels drop and this lesser ability to detoxify free radicals leads to the process of ageing and deterioration in physiological functions. 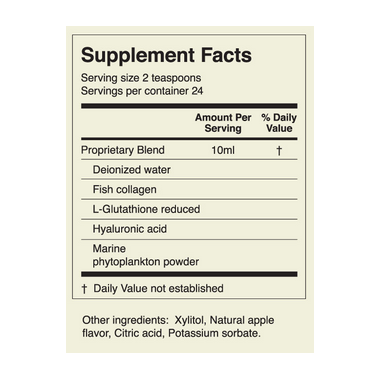 Each two-teaspoon serving provides 65mg of l-glutathione. HYALURONIC ACID: Helps regulate and preserve moisture within tissues and deliver nutrients into the cells. It also enhances the tissue's water retention capacity. Our formula is a vegan-friendly source of pure food-grade Hyaluronic Acid. SAFE: This formula is free of artificial colours and flavours and is suitable for both adult men and women. How to Use: Take two teaspoons (10ml) per day either directly or mixed with your favourite juice or beverage. Warning: Do not exceed the recommended daily dose. Food supplements should not be used as a substitute for a balanced diet and a healthy lifestyle. This product is not a substitute for topical beauty products and acts as synergistic therapy. Not suitable for pregnant and breastfeeding women. Keep out of reach of children. Keep away from sunlight and heat. Do not freeze. Consume within 3 months once opened. Store in a cool, dry place. Shake lightly before consumption. I very like this product. I am new to this product & have been using it for 2 weeks. Honestly, I can't see any difference in my skin. 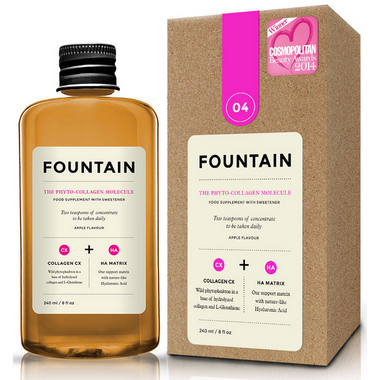 While I love what Deciem is doing with their other product lines (NIOD, The Ordinary, Hylamide) I can't say I am enamoured with the Fountain. Taste & texture are fine but I'm not noticing any improvements or difference. I have only begun to add this to my daily routine. However, so far so good. I've been using this supplement for a few weeks and it has made a noticeable difference in my skin...it glows! I've been using this for approx one month now and have noticed improvements to my skin texture (and glow!). I'm giving it 4 stars only because the taste isn't great - but it's not horrible. Just need to wash it down with a lot of water!